If you have a dental emergency, please contact our surgery as soon as possible using the numbers provided. We always do our best to see dental emergencies on the same day. The first priority of any injury to the head including the face is to ensure that there is no evidence of brain injury. If there is any sign of dizziness, confusion nausea, vomiting or confusion then an urgent medical consultation is required before any dental issues are dealt with. If you have injured your mouth then use a clean piece of gauze and gentle pressure to stop any bleeding, but if it persists after 20 minutes or so then please contact your nearest hospital for emergency medical care. Once urgent bleeding and medical care have been completed, if any dental injury exists, seek contact with us as soon as possible to assess and plan treatment. If you knock out a tooth, try to only handle it by the crown (the white shiny part) as touching the root may damage it. Rinse the root in milk or in the mouth of the person it came from using their saliva. If only water is available, rinse the tooth very briefly (1 second) if dirty. Try to re-insert the tooth (making sure it is facing the right way round) or else store it in a little milk or saliva from the injured person (or even in the mouth of the injured person). This will help to keep the cells on the root alive and improve its chances of successfully re-implanting. Come and see us as soon as you can as it is sometimes possible to re-insert the tooth within the first half an hour to an hour after the accident. If you notice a change in your bite following an hit to the face or if any of your teeth seem to have moved or are hurting either constantly after the injury or whenever they are touched or bitten on, an urgent appointment with us is recommended. Teeth which have been bumped out of position can be repositioned by our dentists painlessly if done soon enough. 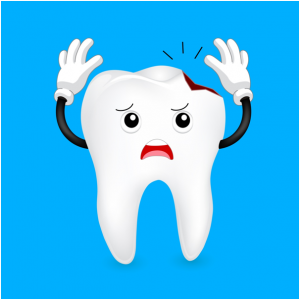 Any tooth which has been hit by accident should be assessed at our clinic as soon as possible. Often x-rays and some tests will reveal that all is well and natural healing can be left to take place. At other times, urgent work must be done to reposition or treat teeth which have been injured to give them the greatest chance of recovery.